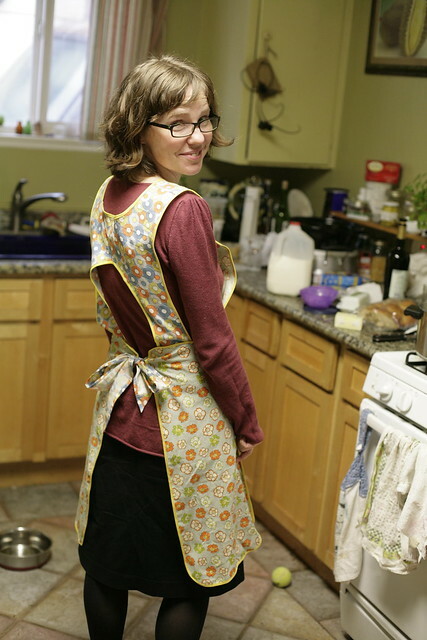 Inder Loves Folk Art: New "Dress" Apron! That's not a dirty kitchen in the background, that's a hard-working kitchen. Here it is! My very own "Protect and Serve Apron"! 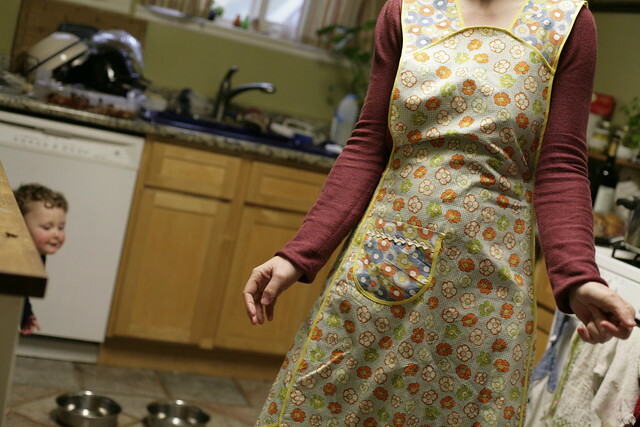 Since this was my second time making this pattern, I was able to iron out (har har) some of the issues with fit that I encountered (too late to remedy) with Rebecca's apron. And since I've now done this twice, I can say with even more certainty: This pattern requires a crapload of bias tape! So. Much. Bias. Tape. That's basically the whole pattern: (1) Get bias tape. (2) Tediously apply bias tape, in huge quantities. (3) Repeat. Throughout this project, the bias tape kept going missing, along with other miscellaneous sewing notions. Each time, I would find it in Joe's top-secret stash spot, the cupboard under Steve's grill in the back yard, usually along with a fleecy sleeper, several dog leashes, and a great collection of sticks. I'm sure this makes perfect sense to Joe, but I admit, I'm a little baffled. But if your measuring tape goes missing in my house, that's the first place I would check. By the end of my apron sewing, I wasn't even bothering to bellow, "Steve! Have you see my bias tape?" (Steve doesn't even know what bias tape is, mind you.) Rather, I would just put my shoes on and trudge out in the rain to check the stash spot, and there it was. I'll give Joe this: He applies his wacky logic very consistently. If he could talk more, I'm sure he'd inform me, in condescending tones, that bias tape belongs in the cupboard under the grill. And then roll his eyes at my inability to grasp such a simple concept. It's the back that really makes it old-timey. Back to the project. 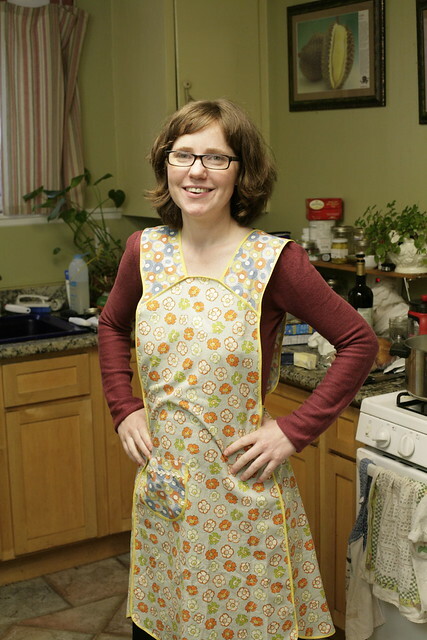 I used vintage bias tape that I bought on eBay; you can't tell from these photos, but there are actually three subtly different shades of yellow bias tap in this apron. I've raved about vintage bias tape before, but I'll do it again: It's usually 100% cotton! And it comes in a world of beautiful, jewel-toned, Springy colors! And you can often get a whole box of the stuff (with some rick-rack, seam binding, and other notions) for dirt cheap! And using vintage sewing notions is green, and can help assuage your guilt at constantly purchasing new fabric! I opted to go for a more practical, and less bias tape-intensive, pocket shape than the flower suggested by the pattern. Seriously, the idea of binding those little flower petals in bias tape ... well, it would involve a lot more trips to Joe's stash, for one. I tried to pick fabrics reminiscent of Depression-era feedsacks. I don't think they are historically authentic, but I love them. And when Joe sees me in the apron, he makes the ASL sign for "flower." Aw. Love that sneaky munchkin on the left. You (and the apron) look great! gorgeous! excellent work! you're far more ambitious than me, dealing with all that bias tape. I'd pay someone to sew it up. What's up with Joe? Did I miss something important? He knows ASL and doesn't talk much? Argh, I've got the non-allergy sneezes too! Well, who needs singing voices when you've got matching aprons! I love the fabric choices. Thanks for the tip about vintage bias tape. I have a thing for 100% cotton... might almost have made all that trimming fun. Almost! Pinkyracer: Yeah, Joe has a speech delay. We're not sure what the issue is. He might just be a late talker. He is learning some signs, though, which is great. Jane: Definitely check out eBay lots of notions. I have the cutest colors of rick-rack and bias tape (mostly cotton) from those scores. You usually just get a whole box (from an estate sale) and some is great and some isn't, but to me, that's half the fun! cute apron!! i never think to use one at home. i use them all day at work so you'd think it was 2nd nature.